A Wisconsin native, Johanna Schilling teaches and performs in the greater Milwaukee area. In addition to maintaining a private studio, she also regularly accompanies professional and graduate recitals. She has performed solo recitals at the Waelderhaus in Kohler, St. John’s on the Lake, and at Samara Home & Garden for their Jane Austen recital series. She has appeared as an on-stage soloist in the Milwaukee Ballet’s production of Giselle as well as in several of their “Behind the Curtain” performances. 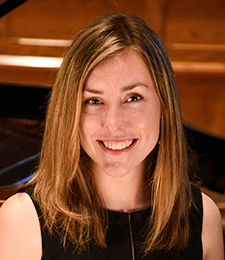 In 2014 she co-founded the Riso Quartet, a piano quartet performing diverse programs of chamber music throughout the greater Milwaukee area. They have performed concerts at Villa Terrace, the Polish Center of Wisconsin, St. John’s Cathedral, Grace Downtown, Alexian Village, the Waelderhaus of Kohler, and the United Methodist Church of Whitefish Bay and were featured on WISN 12’s 2015 Season to Celebrate holiday special.